The data set RESIDS contains standardized residuals created with the ODS OUTPUT statement. The MODEL statement specifies a model quadratic in the log of pseudo-stress for the extreme value location parameter. The quadratic model in pseudo-stress PSTRESS is specified in the MODEL statement, and the RELATION=POW option specifies that the log transformation be applied to Pstress in the MODEL statement and the LOGSCALE statement. The LOGSCALE statement specifies the log of the scale parameter as a linear function of the log of Pstress. 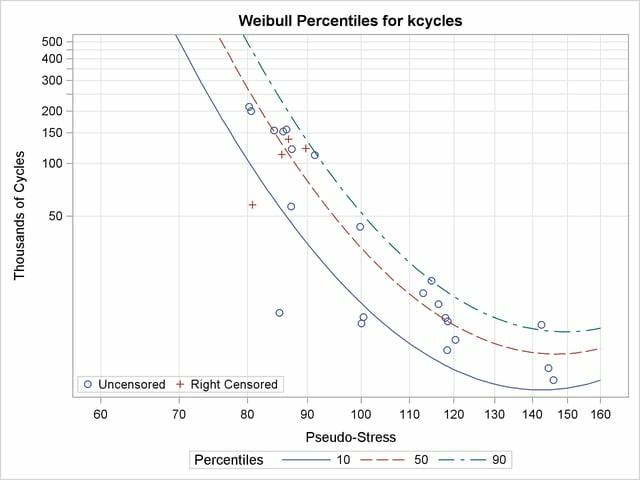 The RPLOT statement specifies a plot of the data and the fitted regression model versus the variable Pstress. The FIT=REGRESSION option specifies plotting the regression model fitted with the preceding MODEL statement. The RELATION=POW option specifies a log stress axis. The PLOTFIT option specifies plotting the 10th, 50th, and 90th percentiles of the regression model at each stress level. The SLOWER, SUPPER, and LUPPER options control limits on the stress and lifetime axes. 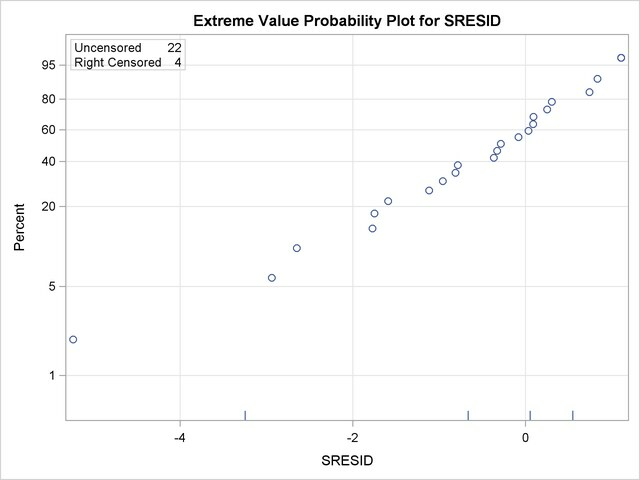 Figure 12.21 displays the parameter estimates from the fitted regression model. Parameter estimates for both the model for the location parameter and the scale parameter models are shown. Standard errors and confidence limits for all parameter estimates are included. Figure 12.22 displays the plot of the data and fitted regression model.